People are moving towards more tech-savvy world today. Humans cannot even imagine their world without the technologies they are surrounded with. There are many automations which are playing a vital role in making our lives easier, but the Internet of Things or IoT solutions have become an essential part of our daily life. Many home appliances and devices have gained internet connection and are becoming more interactive and independent. To learn more about these IoT solutions, lets first understand what is Home Automation and IoT. Also known as Smart Home Technology, is the use of technology to automate your home. It allows you to control almost every aspect of your home through IOT (Internet of Things). It started with the development of Thermostat which has become the fastest growing technology. 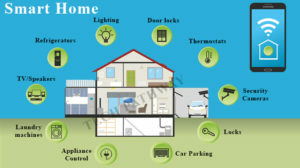 One can use home automations for home security, controlling appliances, monitoring energy and much more. What is IoT (Internet of Things)? IoT refers to an ecosystem in which there are various connected objects which are accessible with the help of internet. The ‘thing’ in IoT can be anything such as a person, a monitor or an automobile with some inbuilt sensors. 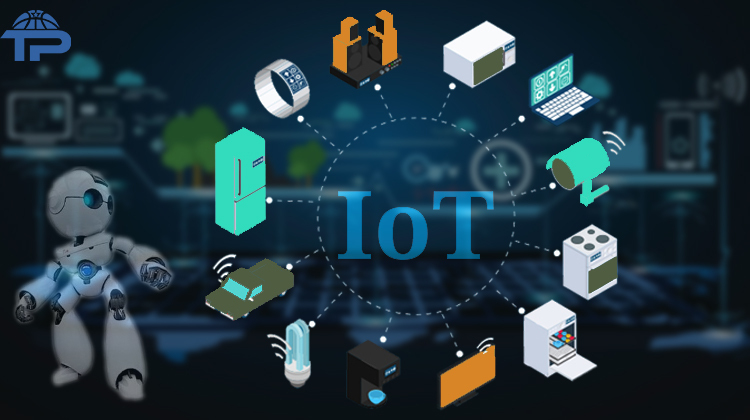 In other words, IoT is the system of interrelated computing devices, digital machines, objects or people that have rare identifiers and the capability to transfer data over the network without any human interaction. 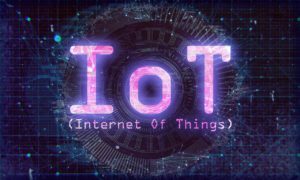 Time saver: IoT proves to be a time saver thing because of machine interactions, which provides better efficiency, helps in obtaining better results and avoid repeating the same task. Multiple tasks: As it saves a lot of time, it performs multiple task using the devices. These can be plants watered, room vacuumed and laundry, etc., with the help of a Smartphone. Home security: People these days are more concerned about the safety of their homes when they are far away at work, on vacations or there are kids and elders in the home. The home automation provides a perfect solution to homeowners in the form of fully controlled monitoring devices. They can have smart locks installed, which provides complete security and warns the owner in case of any unauthorized access. It can also provide safety against any fire or smoke. Easy handling: People can easily operate these devices as these are easy to handle and do not require any specific skill or degree to handle. Save resources: IoT also protects resources such as water and electricity at a high level. It helps us save power bills and provides an ecofriendly environment. For example, if the owner of the house has left the lights on, it can help him/her to turn off the lights immediately from anywhere with just a single tap. 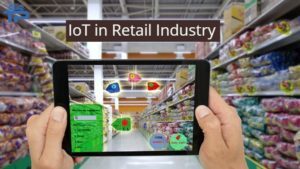 Retail: Retail world is constantly changing with the IoT as now rather than visiting physical stores, consumers can try different virtual stores with larger catalogues and an experience same as actual shopping. 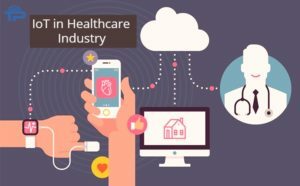 Healthcare: IoT has brought a revolutionary change in the process of treatment and in diagnosing the diseases. With the implantation of medical equipments with IoT devices will help you monitor the patients more effectively. Personal wellness and fitness trackers are gaining much popularity these days. 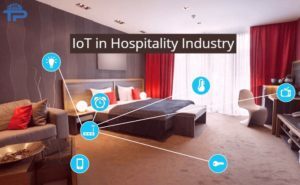 Hospitailty: Hotel industry is drastically changing with the IoT. These days hotels have introduced facial recognition that can allow managers to know more about customers before they arrive and check-in and an emotion recognition camera will help hotel employees predict if a guest is hungry and provide food recommendation based on their preferences. 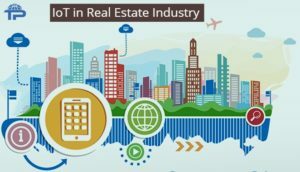 Real estate: IoT has put a significant impact on the real estate industries IoT applications enables more efficient building operations and more revenue generation opportunities. Smart buildings will deliver exceptional energy and will help in reducing cost with all new levels of denizen comfort. These smart buildings are helpful in improving physical security. When we talk about IoT systems, the first thing which pop up in our mind is Smart Home applications. It is an important, efficient and a rapidly growing application. These days, many companies are getting involved with the smart home applications like, Philips, Haier or Belkin. Today you do not need billions to own a smart home rather you just need some amazing IOT devices to fulfill your dream. One such application or device is Amazon’s Echo which is designed around your voice. It uses 7 microphones and beam forming technology and can hear you across the room, even when there is much noise. It connects to Alexa, a cloud based voice service, which provides information, answer your every question, plays music, reads news, check sports scores and weather, and much more, instantly. 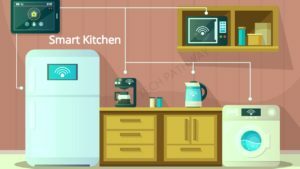 Smart Refrigerators: To alert you in case the door is left open, they can remind you of what you need to buy and few models even have monitors that can stream TV. Smart Ovens: Ovens with IoT technology can be controlled from anywhere. Many of these ovens can be controlled through Alexa. Some smart ovens let you look for recipes and set the temperature needed for them. Smart Coffee Pots: smart pots can be told to brew coffee with the help of your phone so that you can have it whenever you want. 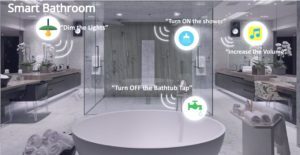 The smart bathroom technology will make you use it more than other rooms. Smart Toilets: it offers you features like touch-free flushing, sensor based open/close of lid and deodorizer, etc. Showers: these can be turned on as per your comfort even before you wake up. Having a newborn is one of the most pleasing and stressful thing in life. But thanks to smart nurseries with the help of which babies are safer and parents can also relax a little bit. Monitors: baby monitors have changed completely you can not only hear your infants, but can visually check up on them from any room. These monitors can easily connect with your phones via an app. Smart Health Monitors: there are many monitors out there which can measure your infant’s heartbeat, breathing, movement, etc. These monitors can also keep a track of diaper changes, sleeping habits and much more. Smart Fans: Some fans are like thermostats which can be controlled from an app on your phone and can be set to sense when they are needed. Floors: there are a few heated floor technology available in the market these days, which can be controlled using mobile phones. Pools: Some smart pool devices help you measure the chemicals in the pool, automate certain cleaning procedures and schedule pool repair. Smart beds: Smart mattresses allow you to control the softness and warmth of your bed. Some mattresses have added features such as massage settings, built-in alarm clocks, and sleep monitoring systems which can help you provide the best sleep. Smart Security: these smart security applications help you protect your home in a different way. A video surveillance can help you keep a tab on your property 24/7. Smart door and window sensors can help you keep a track on entry points of your home. And with the help of smart locks you can lock your doors with the connected device from anywhere and anytime. The scope of IoT solutions does not end here and there are far many applications which are evolving and developing further. So, if you wish to own your Smart Home with all these smart applications, Tech Pathway has a lot more to offer you in the way of affordable and trustworthy automations.